Crystals and Aliens at Thompson Park! 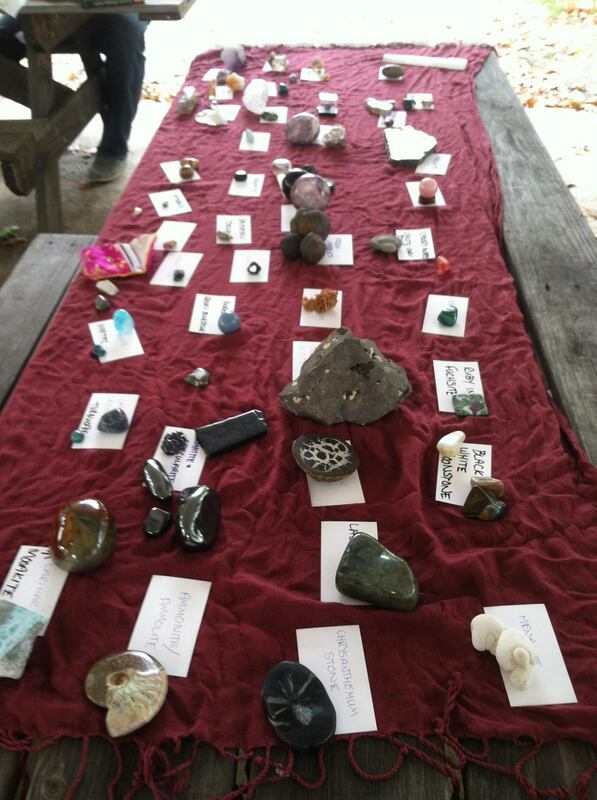 Rivers Protogrove gathered at Thompson Park in Watertown, NY for a workshop on gems presented by our own Tara. It was incredibly informative! She struck a really pleasing balance between the science of gems and the magical properties. Tara has an extensive rock collection that she allowed us to explore. For an experiment, she asked us to look at the stones and select one or two that really called to us. The one I felt most pulled to was what I can only describe as a solid white glob. Something about its soft curves was comforting. Tara chuckled when I picked it out and said she wasn’t surprised. She instructed us to research our stones in one of the number of resources she brought to share. Turns out it’s called menolite and is associated with femininity, the role of the priestess, and lactation! We also learned about the local geology, how to select stones for healing work, not to eat malachite, and how to cleanse our crystals. A big gold star to Tara for reminding everyone that not all gems come from ethical mines and so we should be selective of where we make our purchases! We then had a study group for anyone working on the DP and above. We shared our challenges and accomplishments, gave some feedback, and came up with goals. I’m excited for a future study group meeting. I’m just wowed by how much hard work everyone is doing! After our workshop and meeting, some of us took a short walk to the new sign marking the general area of a supposed vortex/portal. You can read more about it here. Interestingly, it’s in the same side of the park where some friends and I felt some Otherworldly energy before, but we never witnessed any disappearing acts or got lost. 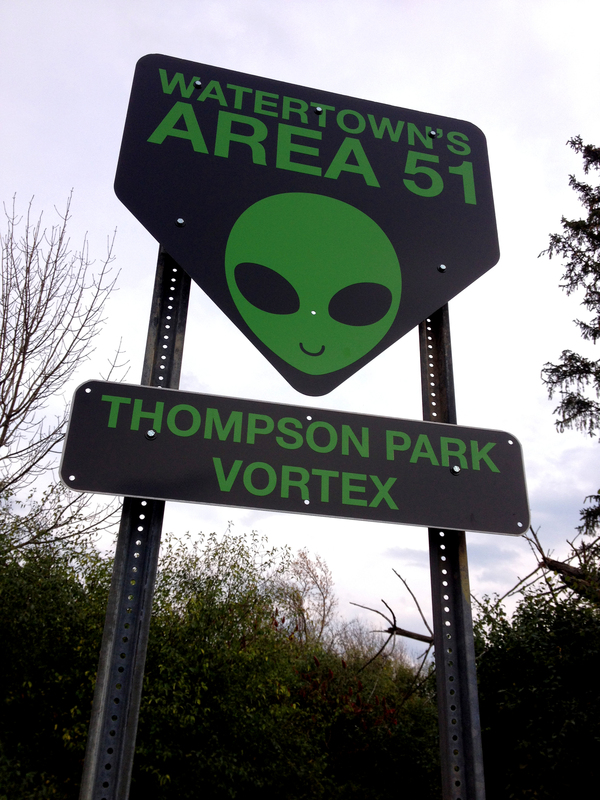 After reading the latest stories about Watertown’s connection to Area 51, I get why the city is celebrating that little bit of history… but connecting the vortex to aliens feels kitschy. That said, it’s all in good fun and if it encourages people to get out and explore Watertown’s beautiful park, why not? As we had our meeting, we saw several people walk or drive by to take a look at the sign. Perhaps open-minded and curious visitors to the 1000 Islands region will detour to Watertown to see it for themselves. Magical Ingredients – At What Cost? Recently on Facebook, someone posted a story and the headline read that the black rhino was now extinct. The story must have been hyperbolized, because my reading revealed that the black rhino is extinct in certain regions but not entirely (thank the Gods!). They are critically endangered and some still exist in captivity or in sanctuaries. So there’s still time, but something needs to change fast. The frequency of news stories and environmental blog updates about illegal ivory poaching is absolutely alarming. It all goes back to greed, a desire for status, and traditional Asian medicine. The last is what is most troublesome to me in a spiritual sense. To me, this is such a difficult topic to wade into because, despite my desire to do what is best for the environment and preserve our biodiversity, this is wrapped up in culture. Normally, I can maintain a sense of cultural relativism, but some things raise hackles because they no longer seem correct in the given context. And yet how do you stop a culture from wanting something that has been part of their traditional medicinal practices for centuries? Vu Quoc Trung, a traditional medicine doctor who works out of a Buddhist pagoda in Hanoi, thinks [ivory] has some limited value. Think of the many correspondences that exist within Western practices – whether for magic or traditional healing (and yes, I know there is a crossover). Once upon a time, it was customary to wall cats into buildings to protect the homes against evil spirits, for example. I doubt most modern Pagans would do that (perhaps some would if the cat were already dead…). Now that’s not the best analogy because cats aren’t endangered, but it suggests that people are able to change their practices despite what tradition tells us. And yet we aren’t perfect here in the West. For example, we know how damaging mining for gems and metals can be, and yet we constantly buy them for our magical workings. Many vendors I speak to don’t actually know where their gems came from or, if they do, how they were mined. Who knows what ecosystem the mining is devastating? Who knows how the workers were treated as it was extracted from the Earth Mama? When you live in the US and import, you don’t really know the conditions unless you go there yourself. Perhaps access is the biggest problem – East and West. We feel that everyone who wants to practice magic (or traditional Chinese medicine) should have access to the materials. Therefore, they should be affordable. To keep things affordable, greedy people are willing to engage in unscrupulous practices to obtain and sell what we consumers demand. Often, the consumers ignorantly or willfully look the other way just so they can have their shiny crystals or ivory. So I don’t have any answer to the ivory problem. I’m hopeful the efforts to educate people in Asian countries about the plight of the elephants and rhinos will change their practices. Yet we also need to be more aware of where we get our own magical ingredients. We need to be conscious consumers and weigh our priorities. Personally, I find the best magical ingredients to be those grown and/or harvested by your own hands. It’s not always possible, but at least you know how they were obtained. When you work with the spirits of Nature and the Earth Mother, when you find them to be sacred, you simply must make these considerations. I’m sure most of my readers remember my posts on the ethics of using silver in ritual, and the reactions and suggestions by others. 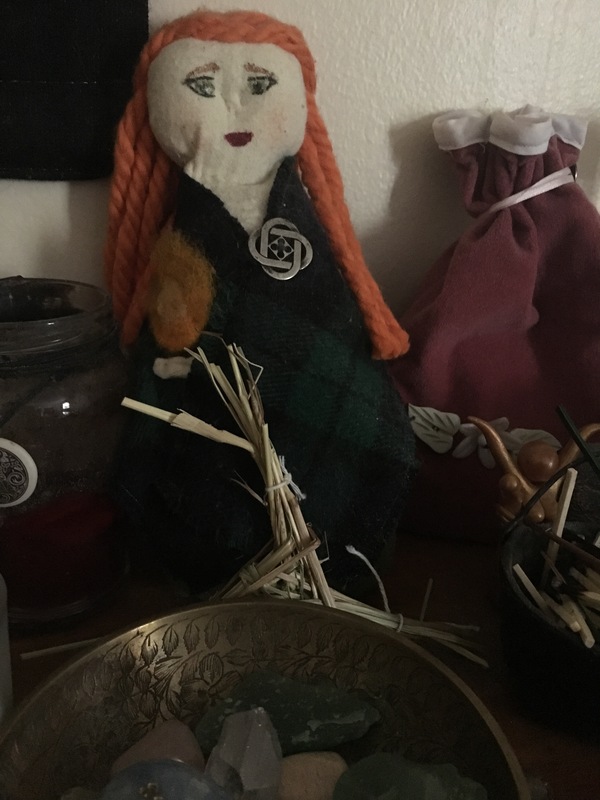 I had an amazing response from others who feel the same way – that Earth-centered Pagans should really try not to support mines that ravage the Earth Mother! It is just unsustainable. Today, Count on the Birds posted a wonderful article on how to find your own crystals! I loved it and could definitely relate since I’ve started to rely on the forest spirits’ generosity for my magical resources. The author recommends looking around uprooted trees. I can think of a few near my home that I’m hoping to visit later today. We’ll see what I find! Usually I happen upon quartz by chance, but I have found some rose quartz. Count on the Birds is from Switzerland, but I could relate to her accounts of finding quartz most often. Inspired, I’ve dug out The Crystal Bible: A Definitive Guide to Crystals by Judy Hall. It’s part field guide and part New Age book, so keep that in mind when considering it as a resource. I wanted it way back when I was first poking around with Wicca. Hubby gave it to me as a gift. Although my interest in crystals waned, I’ve kept it around because of the amazing photographs which are useful in identification. Now I find myself growing more interested in learning about native gems and crystals. According to the New York State Museum, the formation of precious gems, such as diamonds and rubies, is probably impossible in NY due to the lack of necessary stone and mineral deposits. However, along with quartz, one could find “calcite, fluorite of several colors, sphalerite, moonstone, labradorite, and celestine.” Unfortunately, the most likely location of gems, especially the much celebrated “Herkimer diamond,” a type of very clear quartz from that region, will mostly be found down by Herkimer and Little Falls – too far south from the North Country. I’ve probably mentioned this before, but my engagement ring is actually a Herkimer diamond. It was important to me not to support questionable diamond mining operations and to support local, ethical miners who I knew personally. Some quartz balls I’ve had for ages and new, wildharvested white stones and quartz from the forest soaking up moonbeams. Although crystals are not a large part of my spirituality, I have started to charge quartz and white stones for magical purposes. 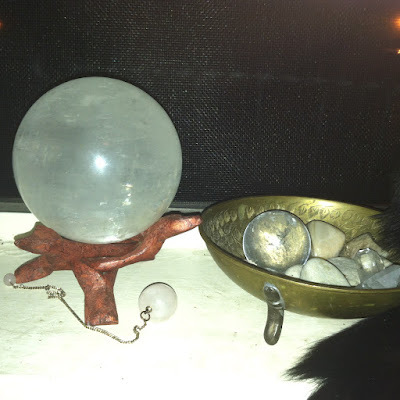 When consecrating items for magical use, I like to surround them in a circle of quartz and white stones charged by the full moon. They are useful in the creation of charms and talismans and, in my experience, they also make good offerings to bodies of water. To me, Druids are supposed to connect with their location. Working with the stones and local land spirits seems somehow more appropriate most of the time. I understand some may feel important situations require different, more rare materials – but I think, most of the time, we should start learning how to use what is around us.